1948 Maverick film producer, aviator, and eccentric wealthy industrialist Howard Hughes purchased RKO Studios for a reported $8.8 million. Hughes led RKO during a long period of decline until the mid-1950s. 1948 The Supreme Court and the federal government's anti-trust Paramount Decree or Decision of 1948 ruled that the major Big Five movie studios were guilty and had to end their monopolization of the industry. They were forced to divest themselves from owning theater chains, by selling them off. RKO Studios (newly bought by eccentric tycoon Howard Hughes) announced that it would be the first major studio to divest itself of its ownership of movie theaters. Block booking, the system by which an exhibitor was forced to buy a whole line of films (both popular films and B films) from a studio was also deemed illegal by a court decision that legislated the separation of the production and exhibition functions of the film industry. This marked the beginning of the end of the studio system, and was partially responsible for a major slump in the movie business by all the studios in the late 1940s. 1948 Warner Bros. was the first to film a color motion-picture newsreel and show it to theater audiences -- its subject was the Tournament of Roses Parade (Pasadena, CA) and the Rose Bowl. 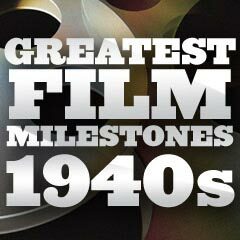 The first newsreel telecast, 20th Century Fox-Movietone News, was shown on NBC-TV. 1948 Olivia de Havilland's courageously-daring, Oscar-nominated starring role in The Snake Pit (1948) graphically depicted the treatment of the mentally-ill. Although some criticized the patient's cure (to become a wife and mother) as unsatisfying, the film spurred efforts to improve conditions in some US 'insane asylums' (mental health institutions). 1948 Columbia Pictures' 15-chapter action serial Superman (1948) (directed by Thomas Carr and Spencer Gordon Bennet), the first serial with the superhero, appeared in the late 1940s with Kirk Alyn as the Kryptonite hero. 1948 In the horror comedy spoof Abbott and Costello Meet Frankenstein (1948), Bela Lugosi (as Count Dracula) and Lon Chaney, Jr. (as The Wolf Man) portrayed their iconic horror characters for the last time on-screen in a feature film. It was Lugosi's second and final time as Count Dracula, following the original 1931 film. 1948 Director Alfred Hitchcock's first Technicolored feature film was the experimental thriller Rope (1948), the first of four films with James Stewart, followed by Rear Window (1954), the remake The Man Who Knew Too Much (1956), and Vertigo (1958). The film was notable for its seamless intercutting of long 10-minute takes, creating the appearance of the film's action occurring all in real-time. 1948 Hamlet was both the first British production and the first non-American or non-Hollywood (foreign-made) film to be presented with the industry's top honor - Best Picture. Its British director/actor/producer, Laurence Olivier, was the first actor to direct his own Oscar-winning performance (a Best Actor Academy Award). [Note: The only other actor to duplicate this feat was Roberto Benigni in Life Is Beautiful (1997, It.)]. Olivier was the first non-American director to win Best Picture. It was the only film adapted from one of William Shakespeare's plays to win Best Picture. 1948 Cole Porter's musical Kiss Me, Kate, inspired by Shakespeare's play The Taming of the Shrew, opened on Broadway in December of 1948. It was adapted for the screen and appeared five years later as MGM's Kiss Me Kate (1953), directed by George Sidney and starring Howard Keel and Kathryn Grayson. 1948 Pioneering film icon D.W. Griffith died at the age of 73. His best known films were The Birth of a Nation (1915), Intolerance (1916), and Broken Blossoms (1919). His last film was The Struggle (1931), the second of only two sound feature films he made during his career. 1948 Disney began to release the "True Life Adventure" series, Disney's first live-action films. There were 14 feature-length and short subject documentary films produced by Walt Disney Productions between the years 1948 and 1960. The first two-reel short was Seal Island (1948).